This is essentially a workaround for the legacy pass manager's weaknesses which associates each assumption cache with Function and clears it if the function is deleted. 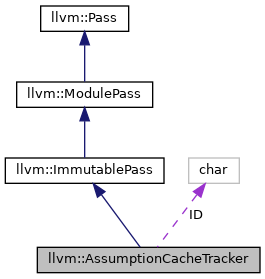 The nature of the AssumptionCache is that it is not invalidated by any changes to the function body and so this is sufficient to be conservatively correct. Definition at line 185 of file AssumptionCache.h. Definition at line 289 of file AssumptionCache.cpp. References llvm::PassRegistry::getPassRegistry(), ID, INITIALIZE_PASS, llvm::initializeAssumptionCacheTrackerPass(), and ~AssumptionCacheTracker(). Definition at line 229 of file AssumptionCache.h. Get the cached assumptions for a function. If no assumptions are cached, this will scan the function. Otherwise, the existing cache will be returned. Definition at line 243 of file AssumptionCache.cpp. Referenced by llvm::getBestSimplifyQuery(), and llvm::LegacyInlinerBase::inlineCalls(). Return the cached assumptions for a function if it has already been scanned. Definition at line 260 of file AssumptionCache.cpp. Definition at line 222 of file AssumptionCache.h. References llvm::DenseMap< KeyT, ValueT, KeyInfoT, BucketT >::shrink_and_clear(). verifyAnalysis() - This member can be implemented by a analysis pass to check state of analysis information. Definition at line 267 of file AssumptionCache.cpp. References B, llvm::SmallPtrSetImpl< PtrType >::count(), I, llvm::SmallPtrSetImpl< PtrType >::insert(), llvm::PatternMatch::match(), llvm::report_fatal_error(), and VerifyAssumptionCache. Definition at line 234 of file AssumptionCache.h.